My recent fascination with Steampunk has led me to dream of several outlandish projects. It is a genre ripe for the picking. 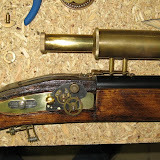 Not limited by actual science but more by aesthetics and cool factor I have been gripped by a kind of artistic fever that is composed of rivets, gears and polished brass..
As such, I have created The Clockwork Rifle. It is based loosely on the classic Kentucky rifle with a few notable exceptions. There is no pan or striker. Also, I have added a sniper scope. This is my first effort and is mostly just a prototype. I carved the rifle stock by hand using a draw knife and a lot of sanding. The barrel is grey PVC. Lots of clock bits. The brass flourishes on the side are cut down cabinet hinges, the brass bands are a thin art brass It was a time consuming process as I wanted the parts I used to look like they fit together. I'm not completely happy yet. I still need a trigger guard and possibly a flip out hand crank for winding the 'main spring' that would power such a weapon. This stock is two pieces but I intend to use a much nicer single piece of wood for the next one. In doing research for this project I discovered that air rifles, that is, actual air powered rifles that could be used for hunting, were in limited production in the 1700's. Lewis and Clark brought one along, mostly to impress the natives. Comments and criticisms of this project are eagerly sought. wow! very cool Eric! being a fan of steampunk myself, i think i might have to have one of those..
Ooh, this looks like it's coming along very nicely indeed! I'm very impressed with the craftmanship - there's no way I'd even know how to begin something like that. Very well done. Gobble...gobble...gobble. Gobble...gobble...goble. BANG! Sergeant York would be proud. If you haven't already, you should probably add wheellocks to your research list. Medicines like cheap Cialis are sometimes prescribed for conditions other than those described in patient information leaflets. Buy Cialis and do not use Cialis for a condition for which it was not prescribed. This brochure summarizes or describes the most important information about Cialis online. If you or your partner would like to have more information, talk with your healthcare provider. You can ask your Canadian Pharmacy, doctor or pharmacist for information about Cialis online that is written for health professionals. Take cheap Cialis exactly as your doctor prescribes. Cialis comes in different doses (2.6 mg, 5 mg, 10 mg, and 20 mg). For most human male, the recommended starting dose is 10 mg. Take generic Cialis online no more than 1x a day. Your specialist will prescribe the dose that is right for you. If you buy Cialis and are older than 65 or have liver problems, your doctor may start you on a lower dose of Cialis. Your specialist may start you on a lower dose of Cialis at the Canadian Pharmacy. If you or your partner are taking certain other medicines your physician may prescribe a lower starting dose and limit you to one dose of Cialis in a 72-hour (3 days) period. Take and buy Cialis or 1 generic Cialis tablet about 1 hour (60 minutes) before sexual activity. Cialis online may or may not be taken with or without meals. Do not change your common dose of generic Cialis without talking to your doctor. Your consultant may lower your dose or raise your dose, depending on how your body reacts to Cialis online. If you or your partner takes too much Cialis, call your doctor or emergency room right away. Buy Generic Viagra, Generic Levitra, Tadalis, Kamagra, Silagra, Caverta, Kamagra Oral Jelly and other Generic Drugs at lowest price with discreet billing & Packaging. We be subjected to thousands of the hottest movies you've been waiting to ready for! And they're now convenient in Hi-Def! There are definitely no limits. Download as much as you penury with incredibly treble speeds. No additional software is required! Only click on a identify with, download a flick picture show and care for it on your favorite player. Why can't I use my powers for evil?